A conference recently asked me about creating a steampunk badge-building workshop for one of their events. After some discussion, the organizer decided that the $165 off-the-shelf parts cost, for each of 50 attendees was simply too big for her budget. 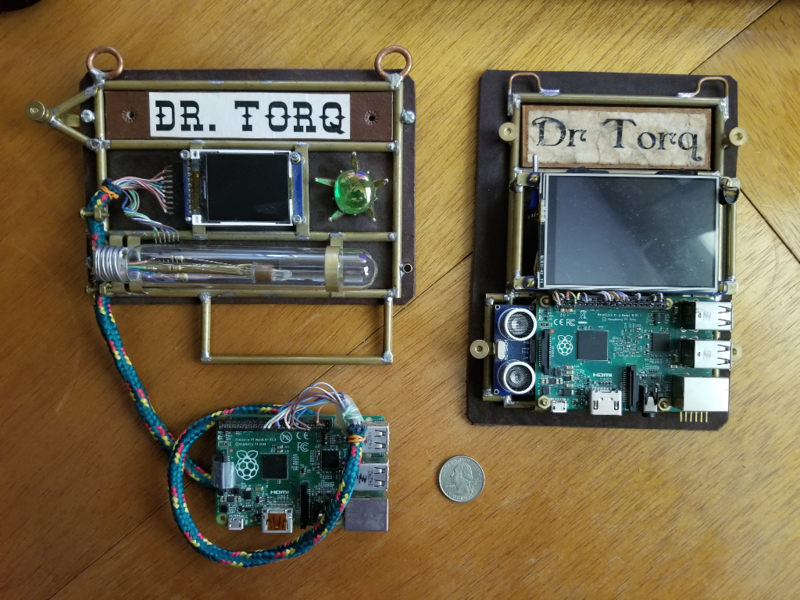 Not only that, scratch building a Raspberry Pi-based badge with a working color LCD, networking, “ozone tube” and a steampunk theme is a bit too complicated to fit into a regular two-day conference workshop. At the time, I didn’t have anything to offer that was a better fit. As a promoter, showman and speaker, I am focused on making sure my home-built gear draws attention. But I realize that sometimes I should tone it down, a lot. For example, while covering a conference as a media guy some time ago, I walked into a press room while a celebrity was sharing his profound insights with the gaggle of reporters. There I was with my gaudy, brightly orbing badge standing in the back, feeling like a heel. I ducked out pretty quickly. The guy on stage deserved the attention. It was his spotlight. So, I’ve started thinking about an “everyday” conference badge that’s still interesting, uses physical computing and yet is low-key. It should also be smaller, simpler and less expensive than others in my series. We’ll look at the initial plans today. The fifth generation badge is 7-1/4 inches tall and 5-1/2 inches wide. The name graphic is 1-1/4 inches x 3-3/4 inches. The fourth generation version comes in at 5 inches x 7-1/4 inches, with a horizontal orientation similarly sized name graphic. It’s amusing to see people catch sight of the 40 some-odd square inch badge on my lapel. The horizontally oriented one really draws their attention. For the everyday badge, various badge dimensions will need modding. The lettering in the name graphics are the perfect size but the overall badge height and width need to be much smaller for this one. My experience is that the name font needs to be at least 5/16 inches tall and easily read from about eight feet away. On the other hand, the overall size should be a more practical 4-1/4 inches x 2-1/2 inches or a little over 10-1/2 square inches. 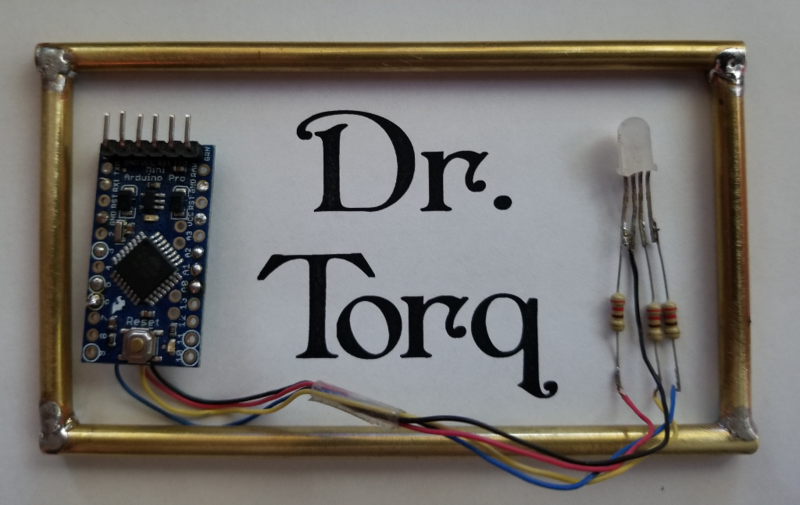 Fortunately, the lettering can stay the same size by using a different microcontroller, a three-color LED and putting “Dr.” above the “Torq” in the name graphic. As with all the other badges the power cable will connect to the battery pack tucked away in a pocket. 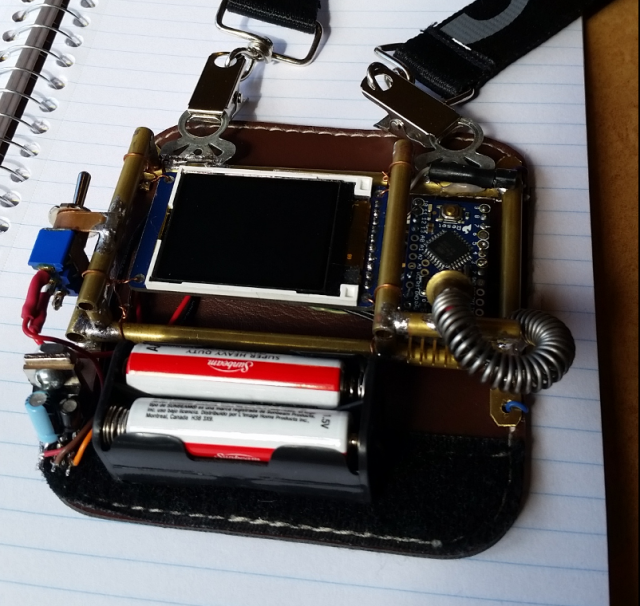 The first generation steampunk conference badge used an Arduino Pro Mini, the little color LCD and a red LED. The red LED lit up the Arduino from a little spring-shaped mounting, that projected out about an inch in front of the board. The Arduino could even loop through a series of JPEG graphics files from the micro-SD memory card mounted on the back of the LCD board. One of the features I’ve always liked on the fifth generation badge was the look of the “ozone tube.” It uses a three-color LED hot-glued to a small quartz crystal and is suspended inside a gutted 4-1/2 inch long glass appliance bulb by a piece of brass tubing. One of my friends at the local robot club told me he didn’t want to touch the badge, in fear of getting a huge static discharge shock. Hey, it’s an ozone tube, right? Come to think of it, some kind of a small plasma ball would be cool in one of my steampunk projects. It might be a challenge to put it on a badge, though. While the ozone tube looks great on the big badge, a bulb like that will not fit on this sized badge. The 10-square-inch badge also certainly doesn’t have enough space for even a little 1.8-inch color LCD, like what I used on the first generation badge. Fortunately, we can change the behavior of a three-color LED in a variety of ways when it’s connected to a Pro Mini. That’s probably enough excitement for a basic name badge. Instead of a smaller glass tube, maybe a mechanical-looking crystal mounting will work. I’m working on some code to cycle through the red-green-blue colors and will roll that out in a later story. Making colors bright, dim and transition from one to another is a simple effect. We could also just “orb” a color, say blue, up and down to simulate a working “atomic” crystal power source. That naturally fits in well with a steampunk theme. Here’s a mock-up of the simple square brass tubing frame, Arduino Pro Mini and the three-color LED, I’ll use for the “everyday” badge. The name graphic was printed on standard laser paper with LibreOffice using the Penshurst font and size 66. You can create a very cool paper aging effect by roughly tearing around the letters and then submerging the paper in coffee or tea. As it soaks up the stain, crinkle up the paper and unfold it a couple of times to give it a weathered look. After drying with a hairdryer, the weathering and steampunk-style lettering looks great when you then finish it off with a coat of clear nail polish. I’ll go over the whole process in a future story. You could even make your own artisan paper by grinding up newspaper with water in a blender, then air drying a thin layer on a piece of window screen. Obviously, staining would simply then be dipping without the crinkling process. I also plan to add a piece of dark leather behind the name graphic, Arduino and LED. Probably will make a spring-loaded clip on the back to position the badge on a pocket or lapel. Methods of attaching my steampunk badges to a shirt or costume have been a challenge. They are heavy compared to the common paper/plastic badge and tend to pull clothing downward at the attachment point. You can always hang it in the middle on a lanyard, which I’ve done with the Gen 5 badge. I’d like the “everyday” badge to go in the traditional position on the left-side lapel. R&D will continue on the problem. A small, simple and inexpensive conference badge will be a nice addition to my collection. Being Arduino-based makes software changes pretty painless while retaining quite a bit of functionality. Future “everyday” models may be able to use the ESP8266 or ESP32 platforms. Maybe I could even change badge characteristics from my Samsung Galaxy 8+. Building a workshop series around the “everyday” conference badge might work for future conference proposals. At the very least I’ll have a low-key badge that I can wear to all kinds of events and gatherings. I also might be able to sell this simple design to small groups who want a one-off, consistent look to their team badges. I’ll update the build in near-term future stories.